Everyone marching on the Palm Sunday rallies will be marching to get rid of the Morrison government. The last six years of the Coalition has taken refugee scapegoating to new levels. The government has changed laws to restrict their rights, leaving thousands to languish in poverty in the community, while inflicting unprecedented levels of brutality, on and offshore, to maintain their divisive policies. Even in the wake of the Christchurch killings, Morrison and Dutton have continued their relentless campaign of Islamophobia and refugee-bashing. But this time around, refugee scaremongering has not bolstered the government at all. No one will mourn the end of Morrison and Dutton. But voting Green or Labor is not going to end offshore detention, nor end mandatory detention. A Labor government is not going to herald the beginning of the humanitarian policy that the refugee movement is fighting for. A Labor government is committed to scrapping temporary protection visas, and says that it will get everyone off Nauru and Manus Island. But offshore detention, and turning around asylum boats, remain part of Labor policy. Shorten says that Labor will accept the New Zealand offer to resettle 150 refugees, but still says that none of the refugees and asylum seekers on Manus and Nauru will be allowed to settle in Australia. There are still 915 refugees and asylum seekers languishing there, most of them with no chance of resettlement. Over the last few months the movement has shown that Labor can be pushed to break with its bi-partisan support of anti-refugee policy. In February, Labor actually voted against the Liberal government to support the Medivac Bill that allows sick refuges to be brought to Australia for treatment or assessment on the recommendation of two treating doctors. But when Morrison announced the re-opening of Christmas Island to hold anyone transferred from offshore, Labor’s initial response was to say detention on Christmas Island was OK. Worse, the promise of the Medivac Bill to get many people transferred has not been fulfilled. In the first six weeks since the Medivac Bill has been law, only one person has been transferred—to the mainland, not Christmas Island. More people have been transferred on the government’s own initiative than have come under the terms of the Medivac Bill. One of the reasons there is only one transferred is because there have been very few applications. Even now, when Morrison’s budget has flagged the closure of Christmas Island—its reopening was a $185 million election stunt—the transfers are still being held back by the timidity of the group assessing and recommending the transfers. 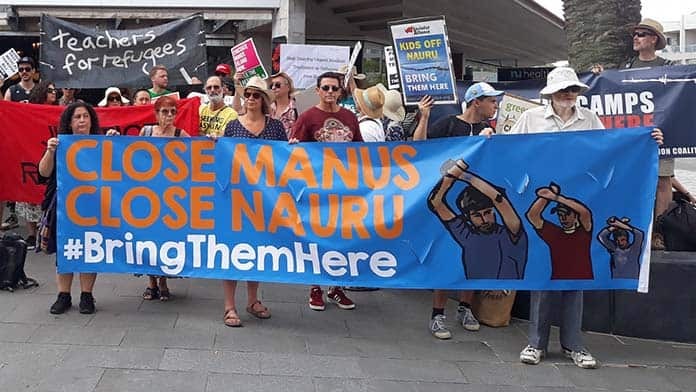 There are others who argue that the movement should compromise with Morrison and with Labor, to drop opposition to turnbacks and offshore detention as the political price for the government to find third resettlement countries, including Australia. But this is no time for compromise. There is much to be won and a lot of unfinished business to overturn six years of the Coalition. The Palm Sunday rallies will be the first chance we have since the election was called to hammer another nail into Morrison’s political coffin. But when Rudd’s Labor government was elected in 2007, it was only a matter of months before Rudd went down the same refugee-bashing road as the Liberals, until Labor finally imposed the present version of offshore detention in July 2013. Since then, the movement has fought Morrison to a standstill. The high point of the #KidsOffNauru campaign last year saw teachers walk off in Melbourne and Brisbane taking the first union industrial action explicitly to oppose offshore detention and call for everyone on Nauru and Manus Island to be brought to Australia. It is a testament to the campaign that there are now more refugees and asylum seekers medically transferred from Manus and Nauru in Australia than remain imprisoned offshore. But there is no guarantee that Labor will adopt a more generous interpretation of the Medivac Bill after the election; quite the opposite. The movement will need more rallies and strikes to push beyond the limited promises of an incoming Shorten government. If Australia is going to finally break with the history of consecutive governments vilifying and denying asylum to boat arrivals, the movement will need to maintain its determination to end turnbacks, open the borders to all asylum seekers, bring to Australia all those imprisoned offshore who want to come from Nauru and Manus, and let them stay with permanent visas.